Snearly recognizes that not all are convinced by the canonical/editorial model of reading the Psalter as a “carefully arranged” book (p10), so chapter 2 begins by addressing this head on. Snearly presents answers to critics’ concerns carefully and convincingly before offering his thoughts on the three most serious dangers to be avoided. First, there is the tendency to overreach and jump to unsubstantiated conclusions: one’s own conclusions must be grounded in the text itself and not an impressionistic sketch. Second is the opposite error of rigorous but narrow analysis of a small collection of Psalms. Third, is the problem of information overload: “evidence must be weighed, not counted” (p19). That is, one must determine the most significant data and build conclusions from there. A constant danger in this reading of the Psalter is subjectivity: rather than a window revealing the text, one’s own reflection is seen instead. After surveying various methodologies of those who came before (chapter 3), a rigorous method is developed to avoid this error (chapter 4). Snearly expands the approach of David Howard by discerning arrangement from key-word links, distant parallelism, common superscriptions, common themes and structural parallels. To achieve this end, Snearly utilized Logos Bible Software and a close reading of the Hebrew text to conduct more thorough and objective sifting of data than previously possible. Chapter 5 outlines various leading proposals for Book V’s structure. Options for arranging Book V fall into either 1) הודו/הללו־יה, aka “Hallelujah/Give Thanks”, and 2) Variegated Taxonomy. The former approach capitalizes upon the recurrence of these words at Ps 106:48/Ps 107:1, Ps 117:2/Ps 118:1 and Ps 135:21/Ps 136:1, resulting in three major groups within Book V: Ps 107-117, 118-135 and 136-150. The latter approach recognizes this element, but considers it along with other relevant data, such as common superscriptions, authorship or genre. Snearly finds the Variegated Taxonomy to “accommodate the evidence of Book V better” (p78). Two Psalms that are difficult to any proposed arrangement are Psalm 119 and Psalm 137; so much so that “[t]he strength of a proposal regarding the organization of Book V is, then, related to how seamlessly these two psalms fit” (p78). Before proposing a superior structure, however, the Psalter’s storyline is outlined in chapter 6. It is discerned that Psalms 1-2 and 89 “influence the narrative arc of the Psalter most clearly” (p79); Ps 1-2 set the story-themes of the Psalter, and Ps 89 is the turning point from which the story must recover. The Psalter sets forth YHWH’s promises in the Davidic covenant of an ideal Torah-devoted Messiah ruling from Zion (Ps 1-2) but the failure of the kings calls YHWH’s own eternal covenant-fidelity into question (Ps 89). Many conclude, given the failure of the kings in Ps 89, that the remainder of the Psalter extols YHWH’s exclusive kingship (e.g. Ps 92-100) but holds no hope for a future Davidic king. Snearly’s work seeks to rebut this view, by recognizing Book V as answering the crisis in Ps 89 and reaffirming and anticipating the fulfillment of Messianic in Ps 1-2. From these three key Psalms, it is revealed that eternal covenant-loyalty, Torah, Zion, and Davidic kingship “are integral to the macro-structure“ of the Psalter (p 116). The remaining chapters tackle these word-themes, discovering that they summarize different sections of Book V.
Psalms 107-118 (chapter 7) address YHWH’s apparent covenant failure seen in the unfaithful kings and resulting exile of Israel. YHWH’s eternal covenant-loyalty, especially as expressed in His covenant with David, is reaffirmed in the beginning and end of this section: Ps 107:1 and Ps 118:29. This sub-division is established by considering its boundaries and inner cohesion, and then its significance to the Psalter’s storyline is considered. Perhaps most controversial in this section is its ending: should it end with Ps 117, 118, or 119? Though many see Ps 118 as beginning a new section, Snearly argues compellingly that Ps 118 “serves better as a conclusion than as an introduction” (p127). Traditionally, Ps 118 has been grouped with Ps 113-117 to form the “Egyptian Hallel”, manuscripts have been found with Ps 118 joined with Ps 117, and stronger lexical and thematic connections are found with 107-117 than 119. Internally, this collection shares common words, phrases (e.g. Ps 107:1 and 118:1, 29; 113:2 and 115:18) and literary features (e.g. acrostics Ps 111-112). Thematically, each Psalm carries forward the theme of YHWH’s eternal covenant-fidelity, a “resounding affirmation” of YHWH’s promises to David (p126). Ps 107-118, then squarely answer the complaint in Ps 89. As a monolithic and solitary pillar to Torah (only one verse, Ps 119:122, does not refer to Torah or a synonym), chapter 8 considers Psalm 119 as its own unit. This may be surprising to have a solitary Psalm as a unit, but it could be considered 22 short Psalms, and in terms of size, it is only slightly shorter than Ps 120-137 combined! Ps 119 has a unique vocabulary, with most Torah words not appearing in Book V. What’s more, numerous connections between Psalm 1, which forms the triad of Torah Psalms with 19 and 119, are discerned. Psalm 119 reaffirms the claims of Psalm 1 that the Torah of YHWH is the pathway to life. Torah-faithfulness is the calling of Israel, but especially the king (Ps 1-2; Deut 17), so “Psalm 119, along with Psalms 107–118, witnesses to the re-emergence of the ideal Davidic ruler within the storyline of Psalms” (p139). Chapter 9 finds that Psalms 120-137 reaffirm YHWH’s commitment to Zion as His dwelling place, and Israel’s hope of return from exile. This collection includes the Songs of Ascents (Ps 120-134), an easily discernible unit of its own, but also Ps 135-137, which are more difficult and thus controversial to place. Beyond the shared superscriptions, Ps 120-134 share several parallel clauses (e.g. Ps 121:2; 124:8; 134:3). More difficult, however, is the placement of Ps 135-137; particularly Ps 137, whose placement has baffled many scholars. Snearly draws on the recent dissertation of James Todd, who argues for the unity of Ps 135-137. Similarities between Ps 134 and 135, as well as key words from Ps 120-134 duplicated in Ps 135-137 (sing, Zion, Jerusalem, Israel, ascents), bring the sections together. What is the significance of this section? The emphasis of praise and place words remind us that the Davidic promises celebrated in Ps 2 and questioned in Ps 89 “are clearly bound with Yahweh’s commitment to Zion“ (p153) in this unit, particularly Ps 132:13, 17-18. As Snearly concludes, “[b]y linking Zion with the king, Psalm 132 demonstrates that the program outlined in Psalm 2 still stands – Yahweh’s reign will be represented by an earthly king whose throne is on Zion” (p153-154). The Davidic king returns in Psalms 138-145, forming a distinct unit according to chapter 10. These Psalms are united in their Davidic authorship (the largest Davidic collection since Book II), as well as recurring links echoing Books I-III, especially Psalms 1-2. For example, Selah occurs four times in this collection, but nowhere else in Books IV or V. King, kingship and kingdom words appear at the boundary Psalms 138, 144, and 145, showing that a New David remains central to the Psalter. Chapter 11 considers the concluding Hallelujah Psalms (Ps 146-150) as a fitting conclusion, not only to Book V, but to the Psalter as a whole. Many conclude that rather than a verse or two concluding Book I-IV, the Hallelujah Psalms conclude Book V. Snearly, however, argues convincingly that Ps 145:21 acts as a concluding doxology. Despite its apparent differences, there are significant similarities between Ps 145:21 and the other closing Doxologies. This means that Ps 146-150 conclude the Psalter itself (much as Ps 1-2 introduce the entire Psalter, not just Book I). The Hallelujah Psalms present the story fulfilled: the story of a heavenly king and his earthly representative who forms a people in the midst of a hostile world and extend their kingdom over the unruly nations” (p181). The Return of the King is a thorough and scholarly work. I cannot offer significant critique as Snearly has met his own exacting standards for Psalms scholarship. First, Snearly is restrained in his conclusions. Chapters 7-11 end with some thoughts on significance for the Psalter’s storyline, but these are modest and thoroughly grounded, and therefore hard to dismiss. Second, Snearly’s gaze is not too narrow to be of any benefit, as he tackles 44 Psalms with skill, managing to discern and clearly explain their cohesion. Snearly’s logical and clear prose is striking. Third, Snearly clearly weighs his evidence. Much more could be said about Book V, but what we have instead is 248 pages of tight argumentation for Snearly’s thesis. Beyond aiding persuasiveness, this results in a much more enjoyable read. 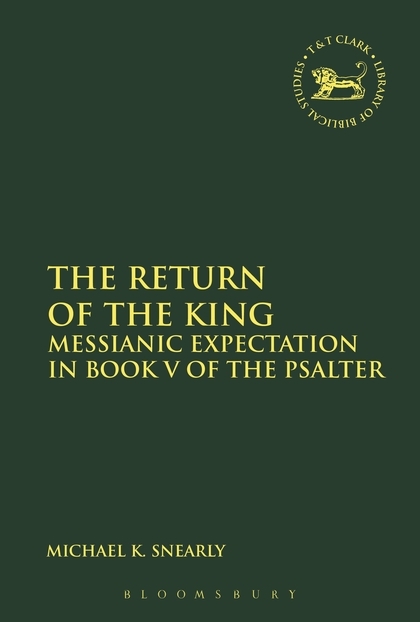 The Return of the King is a clear, compelling and comprehensive treatment of Book V of the Psalms. Not only does Snearly provide – to my mind – a sensible and persuasive structure to Book V, but one that reveals a strong Messianic hope; a conclusion questioned by many Psalms scholars. What’s more, Snearly sets forth a reliable methodology that begs to be applied to the other books of the Psalter. Anyone interested in the arrangement of the Psalter with basic abilities in Hebrew will want to pick this up. My hope is that The Return of the King will bear as much fruit in both the academy and the church as it has in my own understanding. Many thanks to Bloomsbury for providing a copy of this book in exchange for an unbiased review.